This is the twelfth in Blizzard's continuing series of videos, each highlighting a specific character through unedited footage of a single match. We're nearly done, too—Overwatch has 14 characters, so basic maths would suggest there are two videos remaining. 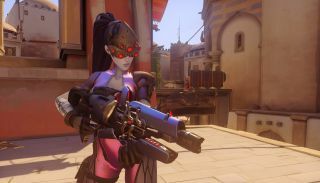 Today, it's Widowmaker. She's the sniper of the group, and so spends most of her time zoomed in on a specific location. A couple of extra abilities offer added utility, including a proximity mine and a grappling hook. Her ultimate lets herself and her allies see targets through walls for a limited time. If you want to see the other character videos, head over to our Overwatch tag page. If you want to play Overwatch, you'll have to wait until this autumn, when the beta is due to start.